There are some places on this planet where nature is stark and cruel, but also breathtakingly beautiful. One such a place is the Kunene Region in Namibia, home to the iconic Namibian Desert Elephant. Few people have had the opportunity to see them, but almost every hard-core wildlife lover would love to. For most, this will forever remain just a dream, as these elephants are being killed off by the Namibian government at an alarming rate. Although the Desert Elephants are not classified as a subspecies, they are geographically distinct, occurring in this region alone (only one other such population exists in Mali). These elephants are uniquely adapted to living in the harsh desert environment. 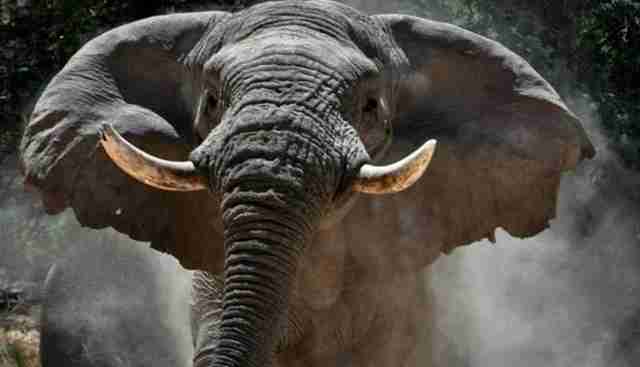 They have some morphological differences from regular African Elephants such as leaner bodies and slightly wider feet. They have mastered the art of digging wells with their trunks, to find water where none seems to exist on the surface. They also can store water in a pouch in their throats. The exposure of the massacre of these elephants happened in May 2014, when an article was published on CNN, alleging that the Namibian government was selling off permits to hunt these magnificent animals. It said that the meat provided to local communities would be distributed to curry favor for the ruling party, SWAPO, in the then upcoming November election. These communities are typically marginalized and have not been prioritized by the Namibian government, but their support could prove invaluable in an election. The article alleged that six permits are being issued. Almost immediately after the press release, proof of five permits surfaced (three more than what the MET admitted to). Heated arguments started flowing on the internet, between pro-hunting conservationists playing the sustainable use card, and concerned foreigners (as well as a couple of brave locals). In the midst of all this, the first Desert Elephant, named Delta, was shot in Sorris-Sorris, a prime tourist area, and favorite route for the Elephants. Delta was killed close to his family, and a short distance from a school, where there had been peaceful co-existence between humans and animals for some time. Suddenly reports surfaced of Delta's herd leaving the area, fleeing into the more remote desert where it would be even harder for them to survive. Reports came in from local camp owners that the previously peaceful herd have turned on the human developments, destroying structures on purpose. It was rumored that they were grieving for their fallen family member. Delta was a young bull, about 17 years of age. Delta was killed by Nick Nolte Safaris, who stated, "Get used to it. We are going to kill many more elephants." As public outrage grew, the battle lines were clearly drawn. On the one side is the pro-hunting fraternity who has a financial interest in the hunting permits remaining available. When all else fails, they play the "you don't live here" card. On the other side are concerned wildlife lovers, conservationists and eco-tourism industries, most of whom can see the value in keeping such a special group of elephants alive. About a month after the initial outrage, an article was published in which the Namibian MET now changed their story, and confirmed that they had issued nine permits for the killing of these elephants, seven of which were for trophy hunting. The outrage escalated to new heights, and Uahekua Herunga, Minister of Environment and Tourism, responded by telling the Namibian Sun that the international outrage about the hunting of the Desert Elephants is caused by "stupidity," adding that foreign critics do not know how to look after their wildlife. "Let them look after their wildlife in their own country. They have nothing left, now they want to tell us how to look after and utilize our wildlife," said Herunga, siding with the pro-hunters. Although not in the Desert Elephant Region, this is still important : Around the same time in 2014, it was reported that a trophy hunter had been trampled by an Elephant in the Uukwaluudhi Conservancy. The hunting party had been tracking the elephants, and suddenly found themselves surrounded by an angry herd. The hunter panicked, fired a shot, and the elephant bull attacked him. The short-lived jubilation on the side of the anti-hunters turned into heartbreak as the news surfaced that the elephant, named Echo, subsequently been shot by MET officials, its meat given to locals. The trophy hunter, Johann Louw, runs both Johann Louw Safaris in Namibia and Southbound Experience based in Germany. Despite the Namibian Ministry selling him out as the owner of an elephant hunting permit, Louw maintained that he was busy doing conservation work, and that he loves elephants and would never shoot any. This was debunked with an exposé of his interests and links. Anti-hunters are outraged because Louw apparently secretly sold "non-hunting" safaris to unsuspecting tourists, but seems to have gotten lured by the big money to be made by killing sentient beings. 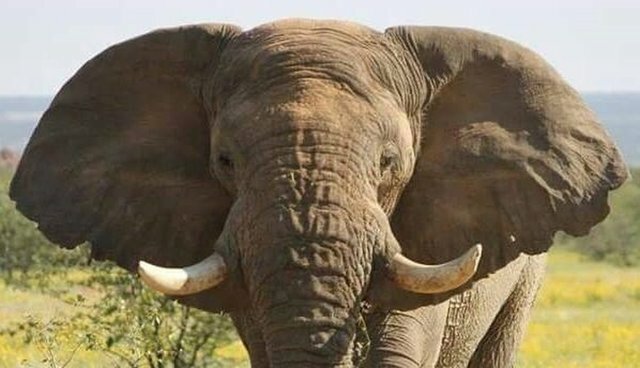 The point is that since the German trophy hunter who accompanied Louw did not get his trophy in the aftermath of the attack another elephant will likely be sacrificed to fulfill the permit, and this might have turned out to be a Desert Elephant. Namibia has been internationally recognized as a leader in conservation, and to this day the MET maintains that they have a sterling record in managing wildlife. However, their flagship program of community-based participation and ownership style conservancies is Uukwaluudhi, the same place where Echo was killed. Their supposedly enviable conservation reputation suffered a devastating blow with the recent poaching of four rhino, before the news of the killing of Echo had even surfaced. Subsequently, more than 68 Rhino have been poached in Namibia, most of them Black Rhino. The Desert Adapted Black Rhino have their work cut out for them now in order to survive. Corey Knowlton and Michael Luzich are two individuals have respectively paid $350k and $200k for their 'right' to each kill a critically endangered Black Rhino in Namibia. The permits were sold by MET, the money supposed to be going into conservation, into the Game Products Management Fund to further conservation efforts. (This fund has not been audited in years - the last known massive expense was for a party for SWAPO). Knowlton and Luzich are now facing a lot of drama as a lawsuit in the form of an injunction against the import permits granted by USFWS (US Fish & Wildlife Services) has been lodged. This means that the money they paid cannot be touched, and remains in essence unusable for Conservation anyway. In October 2014, John Wamback from Pro Hunting Namibia, killed a Desert Elephant named #aBullcalledHope. He and his family languished against the corpse of a dead Desert Elephant in a widely publicized photograph. Soon afterwards, Wamback was exposed for abusing problem elephant tags.(https://www.thedodo.com/problem-elephant-permit-1105273061.html). This is the kind of unethical practice that tarnishes the whole industry with the same brush. Since the hunters closed ranks when the first stories hit the news, very few people are willing to talk and make their opinions publicly known. The problem that Trophy Hunters face these days, is that Social media has made it very difficult for them to hide, and the temptation to post the latest dead animal while proudly grinning over it, is just too much for most ego-driven people. They reached an out of court settlement agreement with MET, and a confidentiality clause was included. 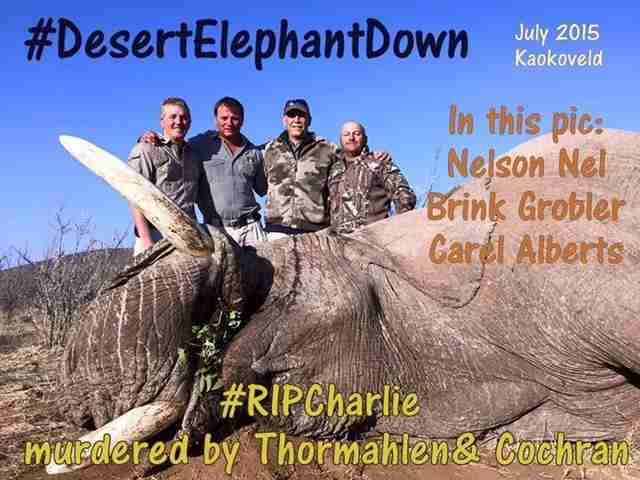 At the time of updating this article, several requests have been sent through to the MET (Ministry of Environment and Tourism) requesting the details of the latest known Desert Elephant permit issued (for Charlie), and the grounds for issuing said permits (sustainable numbers/ problem elephant etc.). Do not expect an answer from them either way, as they have shut down talks with most journalists regarding this issue. The imminent extinction of these Unique Desert Adapted Elephants is something that can be stopped. You can help by supporting the pages dedicated to fighting for these elephants in the links below. And please spread the word. The Namibian government steadfastly stand by their decision to remove almost 10% of the population of these unique elephants. Foreign tourists and interested parties have called for boycotts against Namibia, and a petition against the hunting of any of these elephants have been signed by more than 30,000 people at the time of writing. With many tourists cancelling planned trips to Namibia, and many more stating that they would never go there, it is invariable that the knock-on effect will be felt by the very people affected most by tourism – the local communities where these Elephants live.